The application is open until April 10, 2016. 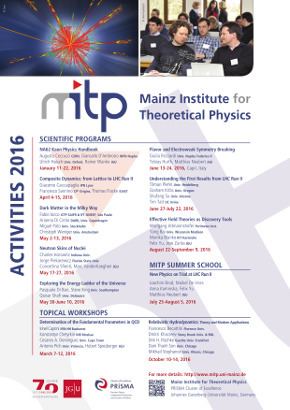 This program aims at laying out the new physics discovery potential of Run II of the LHC from the effective field theory (EFT) approach. Direct searches using LHC Run I data, combined with results in flavor physics, electroweak precision observables, and indirect tests from Higgs measurements, push the scale of new physics to at least the TeV range. The LHC Run II will directly probe the TeV scale, potentially accessing a new threshold of particle physics. The EFT framework may lead us to a discovery at the LHC Run II, especially when there is not a clear resonance particle. This may be done by properly identifying and calculating precisely a relevant differential distribution in order to maximize LHC sensitivity to New Physics. At the same time, searches for dark matter (DM) and flavor experiments also provide important insight on possible thresholds and potential signatures of new physics. If such a threshold is very close to the experimental reach, or even within it, extreme care should be taken when interpreting experimental results in an EFT framework. It is mandatory to have a clear understanding of under which circumstances the EFT approach may be warranted. Delineating this boundary will be a key focus for the community as the LHC resumes operation, and DM and flavor experiments undergo a new upgrade (Xenon 1T, Belle II, etc. ).